The happiest moment of Charlie Bucket’s life was finding the Golden Ticket that allowed him to tour Willy Wonka’s Chocolate Factory. Microsoft fans are finding their dream ticket is more of a light blue color. PC World is reporting a post on the WPCentral forums has revealed a voucher that is redeemable for a Surface RT tablet on its launch day, October 26. There’s still a lot of mystery surrounding the actual program that the certificate appears to be a part of, but the directions on the card make its purpose pretty clear. 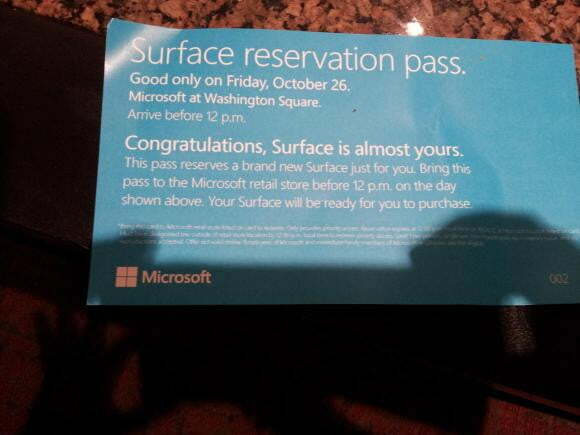 The holder of the voucher is guaranteed a Surface with Windows RT as long as he or she shows up before noon on October 26. Obviously, purchase is still necessary, as the voucher isn’t currency. The original poster in the WPCentral forums stated his belief that it is likely early in the voucher-for-tablet program as his particular voucher was stamped with a “002” at the bottom, signifying it is one of the first his particular retailer had given out. Follow up research has yielded information that supports this idea, as it seems most Microsoft Store employees haven’t even heard of these certificates. They are not a part of a pre-order program and appear as though they weren’t meant for mass consumption — they were meant to be handed out by managers, likely as a way to incentivize launch day purchases. Sales shouldn’t be a major issue for Microsoft, as it appears on its site that the 32GB model of the Surface with Windows RT without the cover already has a 3 week shipping delay due to demand. Pre-orders are still available for launch day for the 32GB model with a Black Touch cover and 64GB with Black Touch Cover. Check out our review of the Microsoft Surface with Windows RT tablet.